Kur mes? Where to find us? 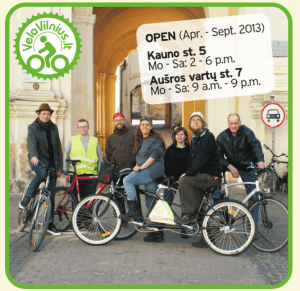 Vilnius bike tours: Bike tour “All sides of Vilnius” starting daily (without Sunday) 11 a.m. Through our work and initiative, we strive to live up to our name “Velo-city,” which means not only velocity as in speed, but also velo- city as in bicycle-city. We are of the opinion that that the only thing Vilnius still needs in order to become a truly European city is more bicycles. We would like to see Lithuania’s capital, our beloved Vilnius, as a truly “velo” city, and we therefore strive to create it as such. 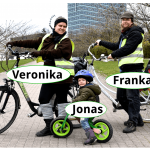 The Velo-City brand had its beginnings in 2008, when Frankas Wurft, Jonas Dovydėnas and Dainius Lanauskas established the corporation “BalticCycle.” Jonas and Dainius are also responsible for the establishment of Velotaksi services in Vilnius. Frankas Wurft is an active board member of The Lithuanian Cyclists’ Community, one of the founding members of the English and German informational website www.balticcycle.eu about cycling in the Baltic States, and administrator of the Lithuanian informational website www.dviratis.lt for cycling fans in Lithuania. Today, Frank Wurft remains as the director of Velo-City, but Dainius Lanauskas and Jonas Dovydėnas are never far away. We also have Veronika Kulikauskaitė with us since 2010 and Andrius Olechnovicius since 2012..